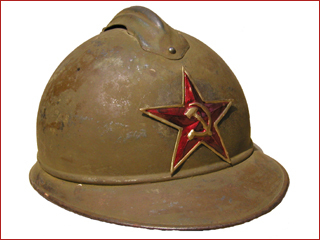 Produced in France during World War I for the Czar, these helmets were used by the Soviet army in the 1920s, featuring the Communist Red Star. 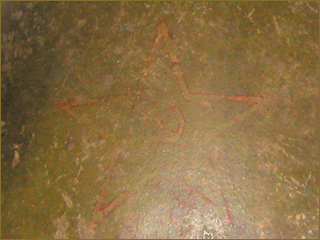 This examples features the first pattern star. 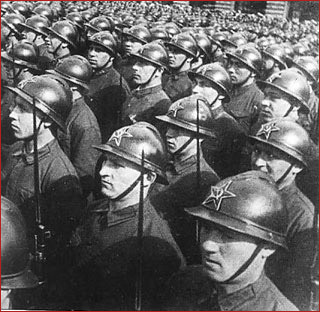 A period photo that shows the Model 1915 helmet in use in Leningrad in the early 1920s. This Soviet experimental helmet dates back to the early 1930s. It was designed by Senior Lieutenant Aleksandr Abramovich Shvartz of the Red Army department of supply. 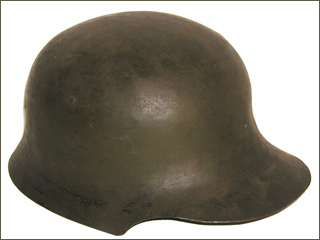 This is one of several helmet prototypes that were created, each having a "Germanic" looking design. 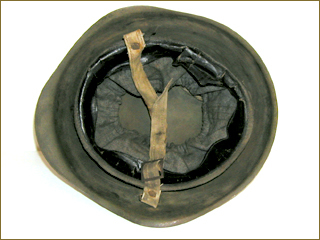 This is one of about 15 helmets found by Thomas Salazar in a storage bunker at an industrial facility in St. Petersburg, Russia. These helmets appeared to have been untouched for aobut 70 helmets. 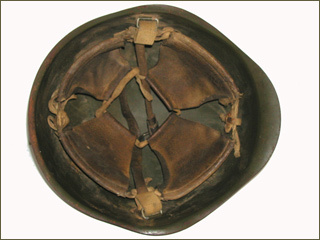 These feature the basic liner system that would be used in the SSh-36 helmets. 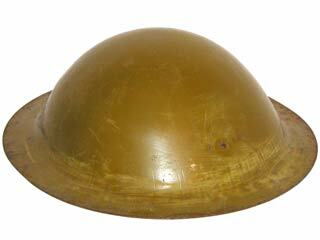 There is no evidence that the Germans were influnencd by this design when creating their own Model 1935 helmet. This design was introduced in 1936 and used during the winter war with Finland and throughout World War II. It features a small crest-ornament on the top, which was meant to deflect saber blows. This design was introduced in 1939 and first used during the winter war with Finland. It features the first pattern liner, based on the German M-31 liner system. 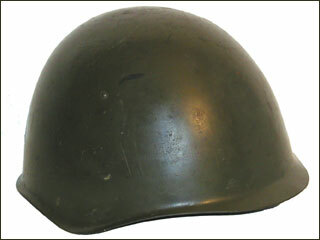 This particular helmet appears to have been reissued by the Germans as a Luftschutz helmet (based on the stamp on the front of the rim). The chinstrap is a German replacement. 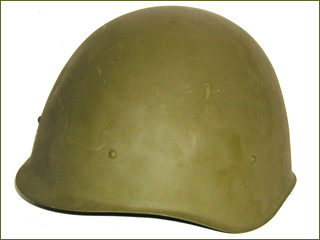 This particular features the second pattern liner, which is the similar as the SSh-36 helmet. 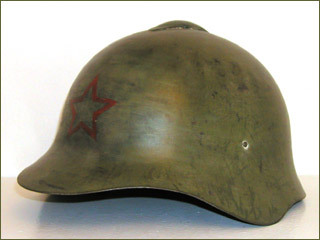 Not technically a military helmet, this helmet was used throughout much of the Great Patriotic War (World War II) during the 900 day siege of Leningrad. This helmet was produced by a local pot and pan factory. 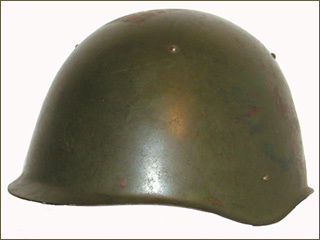 Local authorities decided to create a helmet that resembled the British "Tommy" MkI, to provide vertical protection for the head and upper body. These were typically painted in olive-drab and sometimes featured a white circle with red cross. 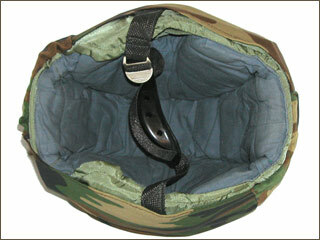 The liner utilized a very simple cloth design held in place by rivets at the front and back of the helmet. While tens of thousands were reportedly produced very few survive today. 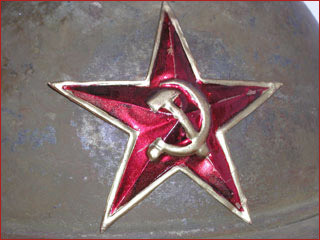 This was the principal helmet design used by the Soviet Union during the Great Patriotic War. It was produced from 1940 through 1960. 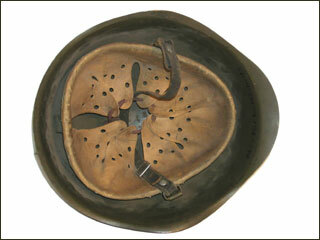 This helmet design features three pads made from oil-cloth. 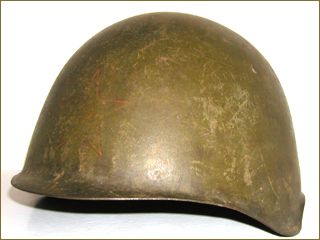 This variation was introduced following World War II, and features the three-point chin strap system used in the East German M-56 helmets. 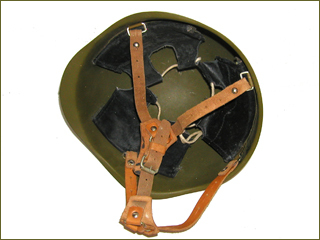 These helmets are often misidentified as being for paratroopers, but photographic evidence suggests these helmets were actually used by motorized infantry. This was the final helmet design change of the SSh-40 model. It retains the shape of the previous models but features a new liner system made of four pads without cushions. These could be loosened by the cord system and a fur cap or other piece of headgear could be worn underneath in cold weather. 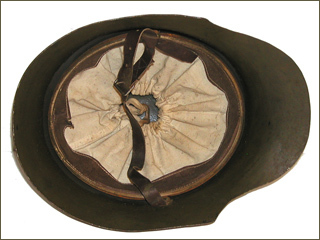 This particular example is unique in that it features leather liner pads rather than the more typical oilcloth. Likewise the canvas and leather chinstrap is unique. 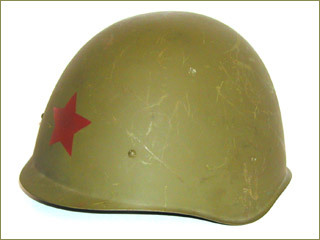 This helmet was reportedly obtained from a veteran of the Vietnam War and was possibly supplied along with Chicom equipment to artillery personnel during the conflict. 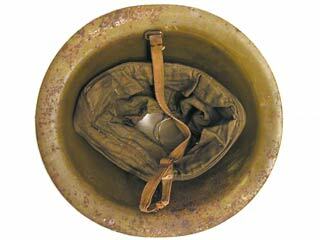 This was the final steel helmet used by the Soviet Union. 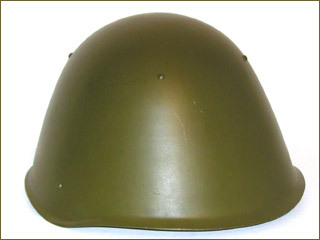 All SSh-68 helmets were made in the Red October Factory in Volgograd (formerly Stalingrad), and thus all feature the same dark olive color. 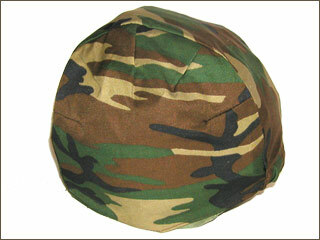 This helmet design is often called the �cone head� helmet because of its high profile. Unlike the earlier SSh-40, it features four pads instead of three. 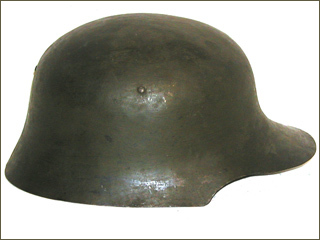 This Titanium Russian helmet used by Spetsnaz and other Russian Special Forces Units during the 1990s. 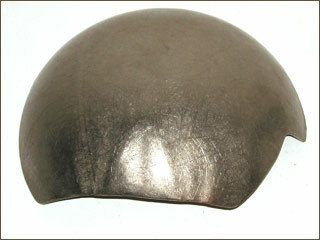 Called the "Sphera" or "Sphere" Helmet, it was composed from four plates of titanium in a cap made of synthetic Aramid cloth.